Polish isn't set in stone. Which just means we can change it more often. I have teamed up with some extremely fabulous bloggers and shops to bring you a "Holly Jolly Holiday Advent Giveaway"! Here is the "reveal" for December 5 - Day one. Are you ready? The prize for Day One is a $20 gift certificate to NinjaPolish.com. Once the giveaway begins, one prize will be revealed each day by the blogger or shop that has generously provided the prize! Simply head to the blog, facebook page, etc. to take a peek. Entering this giveaway gives you the opportunity to potentially win ANY of the prizes that will be included, regardless of whether or not they have been revealed yet! Don't worry, we'll let you know which blog or facebook page you should visit to view the PRIZE REVEAL of the day! 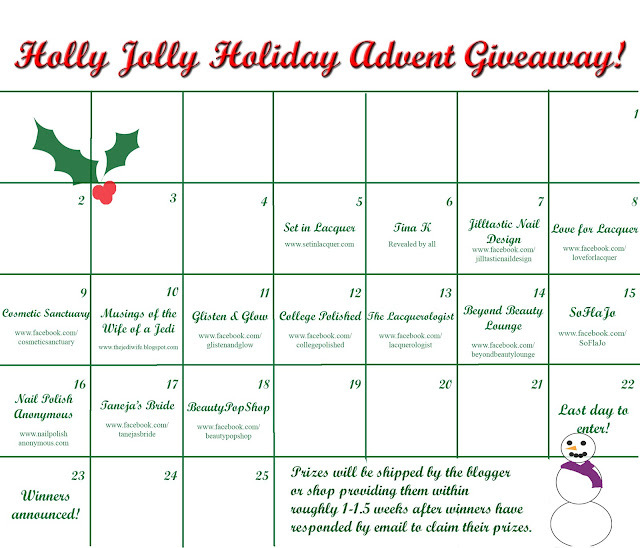 Look at the prize reveal calendar if you want to peek and see who is going to reveal each day.. The giveaway is open to U.S. and Canada residents. Good luck! Thanks for the great giveaway! Doing it as an Advent is a way cute idea! Happy Holidays! Yeah, Canadians can enter. Thank you! What a great freakin prize! Thank you! I'm trying to enter but it just keeps "loading". It's an awesome giveaway & I'd hate to miss out on my chance to win! Kristen, Rafflecopter has been having some issues. Keep trying. I am sure you will get in. Congrats Jen! You won the prize from Jilltastic Nail. Happy Holidays. You need to contact her for the details. I may not always have time to respond to your comments. But I read each and every one of them. A sweet finish to Digital Dozen Childhood theme.